WC7845: 45 ppm (black) and 45 ppm (color), copy, print, scan, network capabilities, fax is optional. Note that the finisher is extra. 55 ppm (black) and 40 ppm (color) - print and copy, faxing, scanning, network capabilities. installation to one computer, is not included. 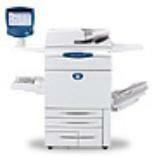 WC7425: 25 ppm (black) and 20 ppm (color), copy, print, fax, scan, network capabilities. WC7428: 28 ppm (black) and 28 ppm (color), copy, print, fax, scan, network capabilities. WC7435: 35 ppm (black) and 35 ppm (color), copy, print, fax, scan, network capabilities. 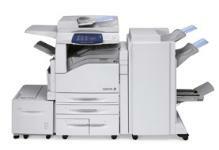 WC7525: 25 ppm (black and color), copy, print, fax, scan, network capabilities. 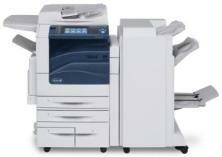 WC7530: 30 ppm (black and color), copy, print, fax, scan, network capabilities. WC7535: 35 ppm (black and color), copy, print, fax, scan, network capabilities. WC7545: 45 ppm (black and color), copy, print, fax, scan, network capabilities. Note that finisher is extra. Please contact us for purchase and rental pricing.